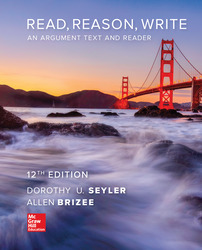 •	Unites instruction in critical reading, analysis of argument, and research strategies. •	Provides a rich collection of contemporary and classic readings to enable practice of these skills and new ideas and insights for readers. •	Shows students how reading, argumentative, research, and analytic skills are interrelated and how these skills combine to develop each student's critical-thinking ability. Chapter 19 The Environment: How Do We Sustain It?